When you first start out as a freelancer, it can seem intimidating. You’ll often look at some of the more experienced freelancers in your field or that you know of online and you’ll wonder why you’re not in the same position. But don’t fret – it’s only natural to compare yourself. However, instead of doing that, you should think about what you can do to get there. You need to remember that you are a beginner, and you will get there eventually. But it takes time. Comparing your start to their success isn’t a good idea. But what you can do, is try to work out what they’ve done or what they’re doing and then apply it to your work and your growth. Sometimes, the only reason you feel so overwhelmed is that you have no idea how to get there. So that’s what we’re going to go over in this post. We’re going to think about all of the things that you can do to get there.- from looking like you’re much bigger than you are to feel more in control and confidence in your abilities. Doing all these should help you find the answer on how to get more clients! Sound good? Perfect – so you’re along for the ride. Now that you’re in, let’s take a look at the steps that could work out perfectly for you. First of all, you’re going to want to start off by creating a brand. One thing that new freelancers don’t always realize is that they are their own brand! Since you are operating a business, you are the service – so it’s you that needs to be branded! However, you’ll be glad to know that creating your personal brand, as www.thebalancesmb.com talks about, is relatively simple. As long as you set up your branding in place and implement it consistently, your freelance business will grow. Once you have your branding in place, you need to set up a website to promote your freelance business. Setting up the website can be quite simple. However, it involves different factors that might confuse beginners. Now, the infographic is dated back in 2017. But the information it carries remains relevant to this very day. When building a site, expect to spend money for tools and services. On the bright side, it won’t be much and it’s an investment worth taking. I built my own site in 2014 and it is one of my primary sources for leads! I implement the best on-page optimization practices to help rank my website on transactional keywords. Thanks to this technique, I don’t have to always reach out to clients to offer my services. People come to my website for my services! This is just one of the many advantages of having a website to showcase your portfolio. And if you do it right, you can attract even more leads than I did! But let’s not get ahead of ourselves. You still need to build your actual site. Namecheap* – Buy your domain name here. As the name suggests, the domains here are very affordable. WordPress (self-hosted) – There are lots of reasons why over 76 million websites run on WordPress. Highly flexible, easy to customize, and a host of available plugins are just some of ’em. Keyword Revealer* – Unlock the best keywords in your niche using this freemium tool. Sign up for a free account to get limited searches a day or subscribe to one of their paid plans to unlock the tool’s power of finding low-hanging fruit keywords. Your website is like the online representation of your service. A bad-looking website doesn’t bode well for your business as you could lose leads nad clients. Therefore, you need to make sure that it’s professional, eye-catching, well-designed, and easy to use. Remember I mentioned that need you need to spend on building a website? Well, you will have to do it again for your design. Personally, I suggest that you get Beaver Builder*. It’s the best drag-and-drop page builder for WordPress. It’s what I’m using now for my website. The drag-and-drop feature is the most crucial feature of this tool. It turns your page editor into a WYSIWYG editor. You can then choose from premium elements to drop on the page and edit it as you see fit. CLICK HERE to visit Beaver Builder. At this stage, you may also want to think about registering your business. Or, if you’re not setting up as a company (you’re going self-employed instead), then you could look to use www.yourvirtualofficelondon.co.uk to make it look like you are. If you have your home details as contact information, it may make you look amateur. Plus, do you want to receive business-related snail mail in your own home? It’s better to separate your work from personal life. Keeping them distant from each other as much as possible helps you organize your life. Lastly, your virtual office lets you meet up with potential clients there instead of your home or some grubby stall at the darkest corners of the street. Keeping it professional means giving the best first impression to your clients and leads. So, having a professional business address can make you seem more established than you are. You’ll also want to make sure that you’re doing some research too. If you want to make sure that you can be the best freelancer you can be, you need to know what you’re doing. …starting with who your target clients are. You can’t just target all businesses out there. You need to refine your search by establishing your buyer persona. Once you have a customer avatar for your freelance business, it’s time to look for them. For this, I use Ninja Outreach*. It’s an outreach tool that helps me compile a list of my potential clients. And it’s really easy to use. Once you signed up for an account, click on the “Create a List” box. Then a window appears on the same page. Fill out the form then click “Find leads. Click “Create a new list” when done. The created list appears on the dashboard. 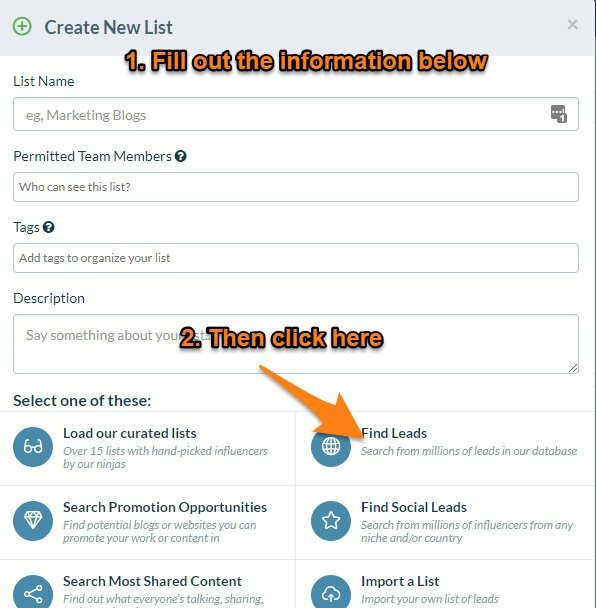 Click on the “Go Find Leads” button. I entered “SEO leads” as the name of the list. You will be brought to a new page where you can search for leads from the tool. It depends on the kind of freelancer you are. For example, if you’re a freelance writer like me, you have to know which niche you specialize in. Through the years, I have garnered experience writing about SEO. I feel confident writing about the subject. And I have posts written about the topic and published on different blogs and sites. My clients are SEO agencies! There are agencies who might be looking to add another writer into their talent pool. Or there are those who are looking for a blogger to publish content for them. Either way, there’s an opportunity for me waiting in the corner. And I can get hold of that opportunity using Ninja Outreach. On the search bar, type “SEO” and check the “Company” box. And with just a few clicks of a button, you have generated over 30,000+ leads for your freelance business. From here, you can click on the “Save all” button to store them to your list. 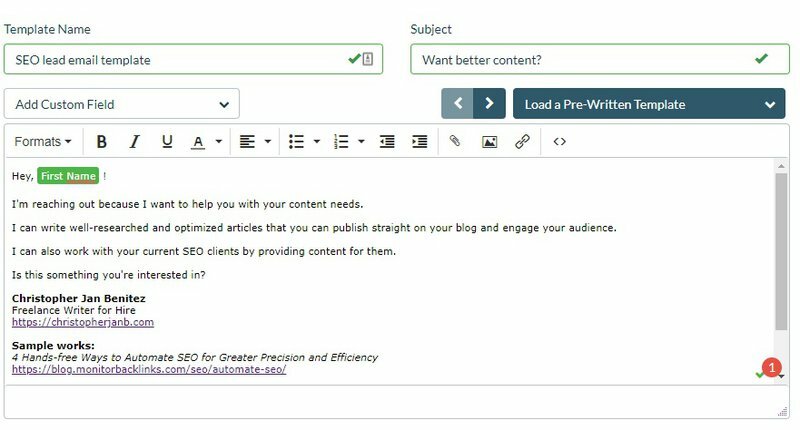 A lightbox opens so you can save the leads in your list. It takes a couple of seconds before Ninja Outreach saves all of them in your list. You will then see the SEO leads list grow in number on your screen. Building your list of leads is just half of the battle. You then need to create an email template that you will use to reach out to them. Cold email is a very tricky method to get clients for your freelance method. 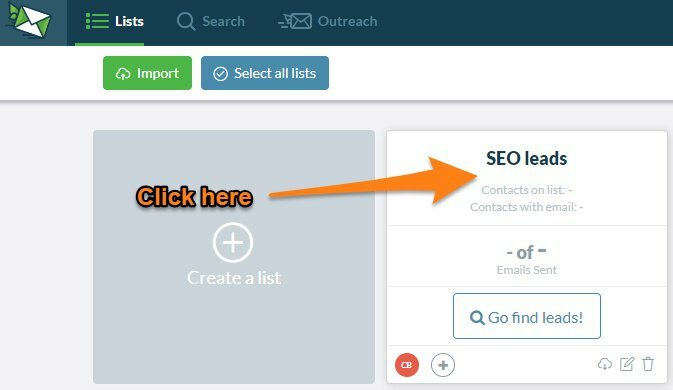 If you set up this one incorrectly, then you won’t convert leads into clients from Ninja Outreach. However, with the right cold email, expect them to come running and asking you to become their client. Then click on the “Create template” button. A lightbox appears where you can enter your cold email template. 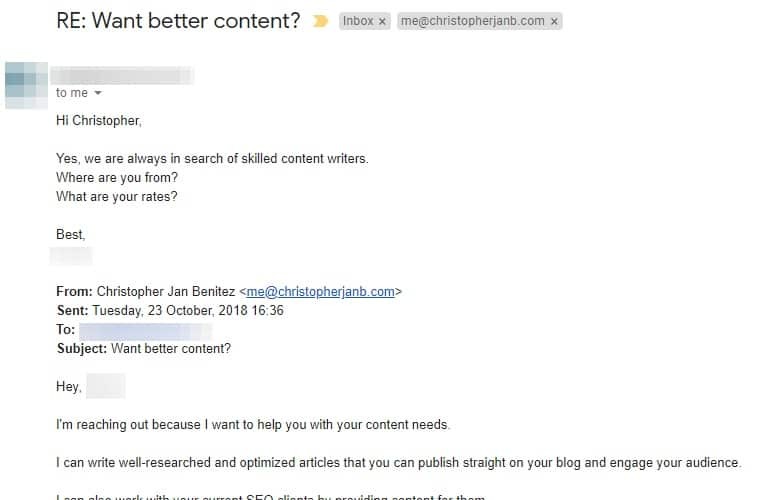 As mentioned, your cold email is the most important factor of your blogger outreach. It may not be the best email there and I’m sure that you can make a better one you can send to your leads. On the subject, “better content” is something all SEO agencies want and need. Therefore, it should pique that interests and encourage them to open my email. I have five sentences in total in this email (not including the signature and sample works). The second sentence cuts to the chase and expresses my intention to work with them. The next two sentences address two of the biggest issues in content writing for SEO. By telling them that you can write well-researched and keyword-rich content to their blog and clients, you also raise the bar of expectation for your services. The last sentence puts the ball on their court. I’m sure they want better content, but will they reply? To help them with their decision, I’ve included a link to my website that they can visit and my best sample works related to SEO to date that they can read. If they’re impressed with what they see, there’s a good chance they might reply! But before we dispatch this email to your leads, you need to fill out your contact form details. Ninja Outreach will send the emails to their email address. However, if the email isn’t available, the tool will send it using the lead’s contact form found on their site. Therefore, you need to cover all your bases and make sure that your email will go through the contact form as well. To do that, click on the “Contact form” tab on the email editor. On the next page, you need to fill out the information that will be entered on the site’s contact form. The tool will redirect you back to the Templates page. Scroll the page to find your template. Next, I suggest you create a follow-up email to your first email. There are times when your leads receive and open your email but forget to reply back. By following up with another email, you get them a gentle nudge about your previous email and increase your chances of getting a reply. To do this, simply repeat the process of creating a template email. 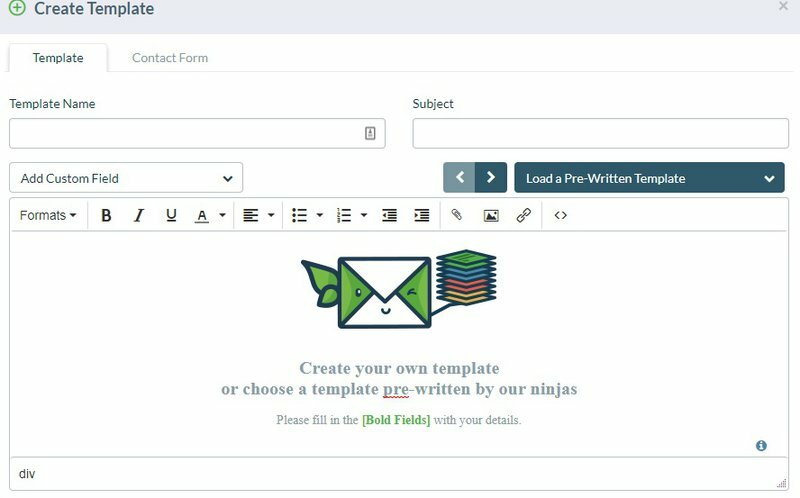 Click on the “Create Template” button and compose your follow-up email. Once you’ve saved all of them, go to Outreach > Autosending from the menu. On the Select a List drop-down menu, click on the list you created. On the Select Email drop-down menu, click on the email address where you want to send the email. 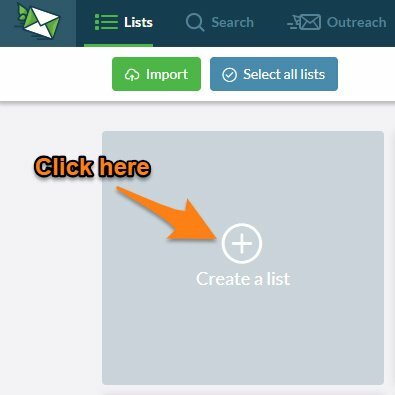 (To add more emails in the list, click on your Profile icon on the upper right part of the screen, click Settings, then click “Connect to Gmail” or “Connect an email account (IMAP)” under Connected emails. On the Select Template drop-down menu, click on the email template we just created for this campaign. Under “How many emails do you want to send per day,” it’s up to you regarding the number of emails you want to send in a day. Just make sure that you don’t exceed sending over 1,000 emails in total using your email account. Under “Setting up your schedule,” it’s best to choose later. Not only will you be able to schedule the start of the campaign but you’ll also determine the days of the week when the tool will send the emails. For best results, uncheck the weekends from the schedule. Some businesses close shop during the weekends and they emails will just bounce back to you. Next, you need to add the email follow-up. Choose the template and the number of days when the recipients will receive the email after the first email is sent. Once you’ve confirmed the details, you need to validate the contact details of the people in your list. 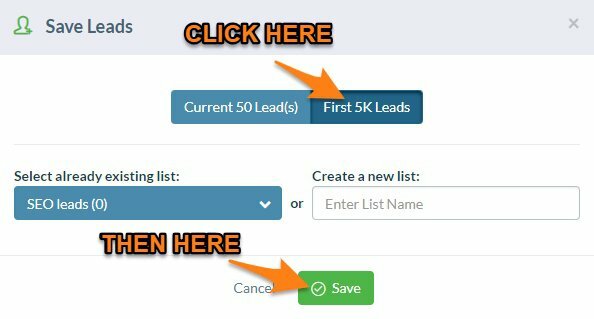 Scroll down the page to filter your list of leads. 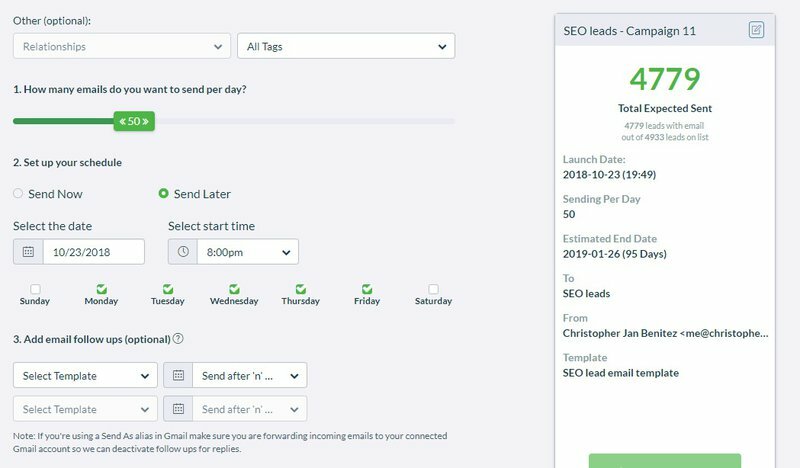 To make this quick, click on the lightning icon to verify all the emails of your leads. 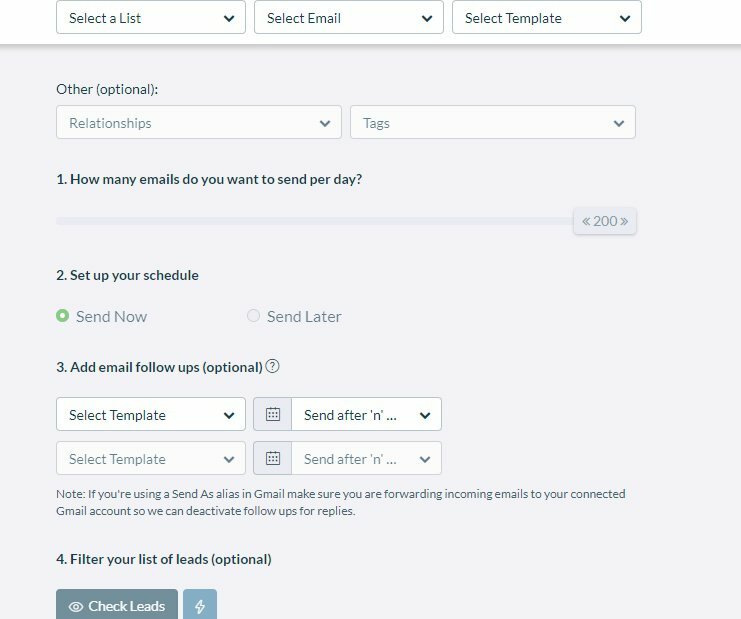 From here, you can toggle whether or not to send emails to leads you’ve emailed in the past using Ninja Outreach and those with missing fields. In this case, you need to not include leads with missing fields. It will decrease the emails in your list. But that’s the only way we can push forward with the campaign. 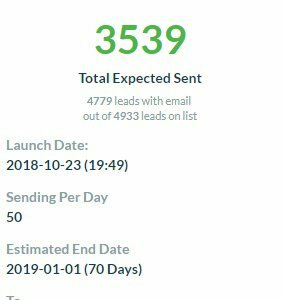 The tool will process the leads who will receive the emails. And that’s it! The tool will take care of sending the emails on your behalf so you can focus on doing other things for your freelance business. Out of the 50 emails I sent for the day, I received one reply from a prospective client! To this, I say – HELL TO THE YEAH! Now, there’s still work to be done. I still have to close this lead into a client. That’s another story for another day. However, through cold email outreach, I was able to reach out to people whom I had no connection with before into someone who’s interested in my services! If I can do this for my freelance business using Ninja Outreach*, so can you! Then, you might want to think about writing a blog. When it comes to blog posts, they can be great for SEO and getting your site noticed. But not only that, you can show off your expertise to your ideal client or help other writers too. So make sure that there’s a blog section on your site and start writing about your craft. And, you absolutely have to make sure that you’re producing great work as a minimum. If you can do a good job, clients will repeatedly hire you and even recommend you to others. To make sure that you’re using things like www.neilpatel.com to grow your craft and constantly look to improve. And then from here, you’re going to want to know where you’re going. And this is where a growth plan comes in. It’s going to be important for you to be able to think about where you want to take your freelance business and how you’re going to do it. The good news is, you’re already working on a lot of it. So you can take a few of this steps and add them into your growth strategy. Then, as you’re moving forward and ticking each section off, you should find that you’re well on your way to where you want to be. Have more ideas on how to get more clients? Share your tips by commenting below!